We're back! The past 2+ months, we have been focused on getting our projects designed, assembled and shipped out before baby U arrives. It hasn't left much room for writing, but today we are taking time to reflect on one of our 2016 favorites- Melissa + Colin. We truly can't believe it has been about a year since we sent out Melissa + Colin's invitations. These two were super fun to work with and we weren't surprised to hear their wedding was a blast as well! They choose a classic letter pressed invitation suite with grey + dusty blue ink. We loved how they pulled every piece together with a thick blue silk ribbon. Choosing to have something this traditional and classic will never go out of style! 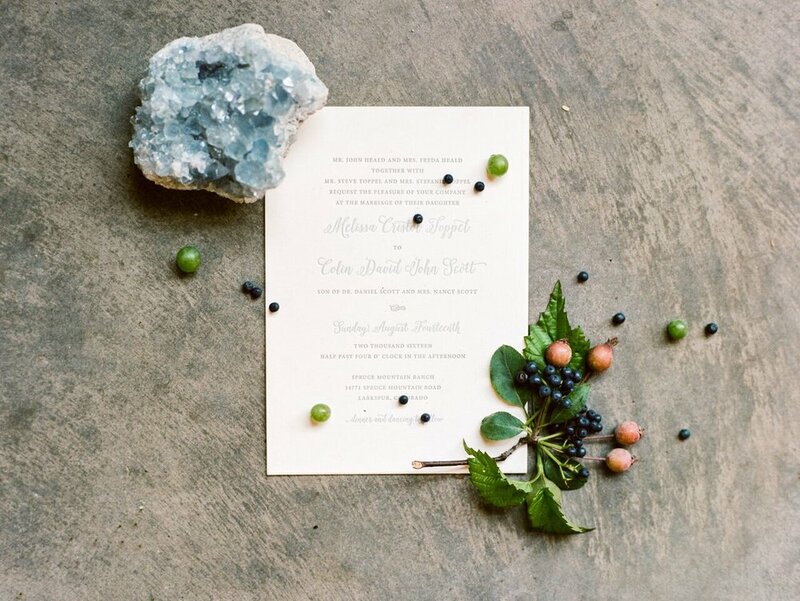 Big shoutout to Michele Hart Photography for the dreamy photos of their stationery + Wedding Day! We feel like a kid on Christmas morning when we get back images like these! Enjoy all the gorgeous details of this wonderful couple's Big Day!